Our Artisanphonics EB-03 earphones are housed in premium wood reclaimed from luxury furniture manufacturers, which would otherwise have been wasted. 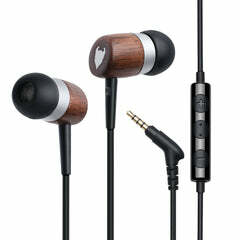 The premium wood housing provides superior acoustic performance and makes each pair of earphones visually unique, displaying their own individual wood grain and colour tone (please see the secondary product images to view examples of the possible variations in colour). We have configured the drivers of the EB-03 to produce powerful sound with vibrant bass and balanced musical detail. They punch well above their weight in terms of sound quality. To prolong cable life, we use an Aramid fibre-reinforced cable with a 135-degree angled 3.5mm connector. This 3rd generation (EB-03) model has an extra-reinforced jack. The lower half of the cable has a braided fabric outer to minimise tangling (the top half is plastic to minimise noise friction). 2 Clicks: Skip to next music track. 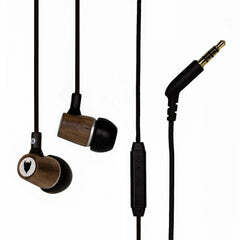 Protect and care for your headphones by always placing them in the natural fibre bag provided when not in use. As with any decent earphones, it is imperative that you use the correct fitting earbuds. This seals the ear canal and produces a much higher quality sound (it makes a very big difference).